To make good fried chicken isn’t that hard. 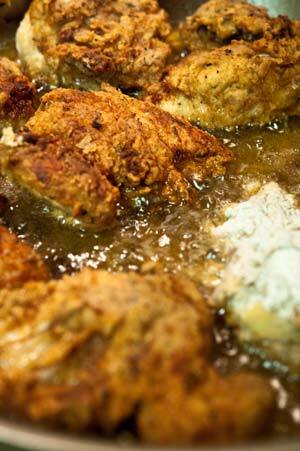 To make great fried chicken, takes a little bit more effort, that yields deliciousness. Follow these easy steps to make a better fried chicken, both in flavor, seasoning, moisture, texture and crunch. First these Cornish Game Hens are beer brined in Sierra Nevada Pale Ale, creating a moist and seasoned ‘into’ the meat verses ‘on the outside’ pieces of poultry. After a 12 – 36 hour bath, the birds are then soaked into a seasoned buttermilk, enhanced to bring out more flavors in the beer style, showing the balance between the malt backbone and the grapefruit forward citrus notes of the hops. After another long soak, the meat is both well seasoned and tender from the acid that the buttermilk added. It is coated in a seasoned flour mixture to enhance the flavors found in cascade hops, a principle hop in the brewing of this iconic brew. 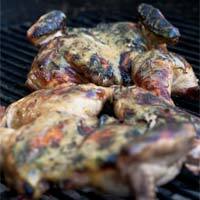 Pale Ale Beer Brined Cornish Game Hens that are then marinated in a seasoned buttermilk, coated and fried to perfection. 2 tablespoon thyme, dried, French available at Savory Spice Co.
1 tablespoon roasted garlic powder, available at Savory Spice Co. In a large pot, add water, parsley, thyme, bay, garlic, onion, lemon, grapefruit, peppercorns, salt and honey. Bring to a simmer for 5 minutes and remove from the heat. 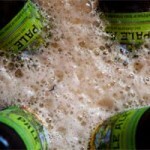 Add the ice and beer; this will help cool the brine solution. The temperature should be around 36°F | 2°C to 38°F |3°C. Refrigerate the brine until it is well chilled (the brine can be made three days in advance). Remove the spines from the hens by turn it with the spine facing toward you. Using a sharp knife, cut down both sides of the spine and remove it. Split the chest bone to lay the hen flat. Next, remove the legs from the breasts and cut off the wings. Set aside. Use either a large 2-gallon container or 2-gallon Ziploc bag and add the Cornish game hen to the brine, then top off with the brine. Place in the refrigerator or in a clean cooler (with Ziploc bags of ice) for at least 12 hours and up to 36 hours. Remove the hens and dry well with paper towels. In a pitcher of a blender, add the buttermilk, along with the cut up lemon, salt, thyme, paprika (sweet or smoked), roasted garlic powder, rosemary and pepper. Purée the mixture together and place into a either a large 2-gallon container or 2-gallon Ziploc bag and add the Cornish game hen. Toss to coat evenly and place into the refrigerator for at least 2 hours and up to 8 hours before serving. This extra step will further tenderize the Cornish Game Hens and add additional flavor to them. In a shallow bowl, add the flour and mix with the salt, thyme, paprika (sweet or smoked), roasted garlic powder and pepper. 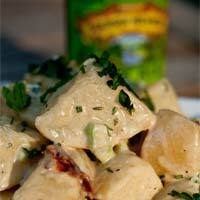 In a Dutch oven or cast-iron pan, heat the oil | rendered lard | shortening to 315°F | 157°C. Set up a cooling rack over some paper towels or paper bags. First, take the buttermilk coated breasts and add to the seasoned flour, flipping to coat evenly and tapping off any excess flour. Place the hens back into the seasoned flour and press the flour into and around the hens, leaving no dry patches. Set on a plate and repeat with all of the remaining pieces. Now, let the Cornish hens sit for 30 minutes, to warm up slightly, making them cook more evenly and to also set the coating, allowing it to absorb the buttermilk and make a killer crust. Add the coated hens to the oil. The oil should come up to about 1/3 the side of the meat. Fry for 6 - 8 minutes, then using tongs, flip the pieces and cook another 6 - 8 minutes, or until the meat is cooked through and reaching an internal temperature of 165°F | 74°C. Check to keep the heat of the oil around 315°F |157°C. Remove the pieces to the cooling rack and repeat with any remaining pieces. 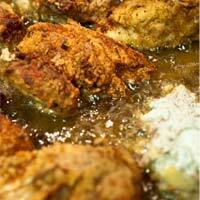 To serve, use the Honey Pale Ale Mustard Sauce as a dip for the Buttermilk Fried Cornish Game Hens. If you like your fried chicken spicy, add in 2 - 5 tablespoons of your favorite hot sauce(s). Mix this into the Buttermilk Brined Cornish Game Hen Ingredients directions.